Last November, uConnect held our inaugural #CareerEverywhere one-day Conference. It was gathering of higher ed leaders who are making “Career Everywhere” a reality in a very meaningful way. If you’re interested, you can check out a recap of the event here. Some of the highlights of the day were the great presentations led by innovators who have been successful in implementing change to transform the campus culture and daily student experience. One of the speakers at the event, Monica Clem, Edinboro University’s Executive Director Career Development and Experiential Learning, will be kicking off our webinar series with an engaging session, “Making Career Mission Critical”. 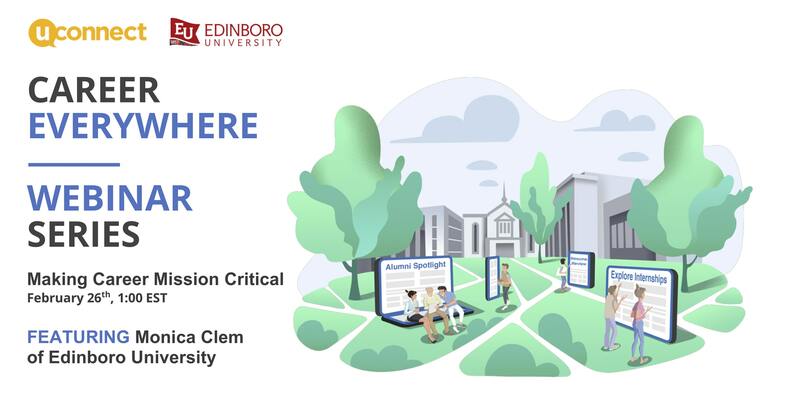 Join this webinar and hear how Edinboro University adopted a new ecosystem approach to Career Services. The new approach elevates the value that Career Services provides to students, and increases its impact at the university. Visit the registration page to sign up or learn more about this great event! And if you are interested in the next #CareerEverywhere one-day conference, send me an email: Lisa@gouconnect.com and I’ll share a preview of what’s being planned!